Q: Tell me a bit about the band and when you first started. 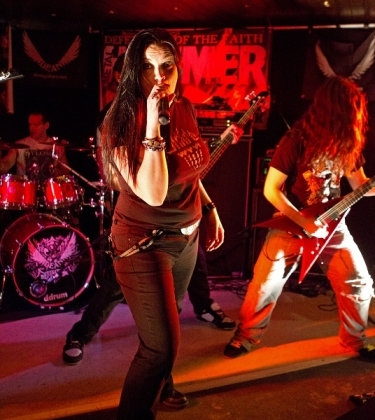 [Giles] Triaxis was formed in 2006, and was originally started by Clare and I. and we started off really as a cover band having a bit of fun doing Metallica, Iron Maiden and other classic metal covers. We started doing little bits of original material and it just kind of went from there really and we went more down the original route and completed the original line up, November 2007 when Krissie joined us, and we just got more serious and started doing more gigs and eventually started writing more new material and released our debut album August 2009. We took a bit of a break thereafter and Glynn joined us in August last year (2010), and we went on tour and here we are playing Hammerfest, so the bands around four and a half years old - a few different incarnations but thats the history. [Owen] That's the short version - we've been going four and a half years. [Krissie, Giles, Owen] Metal ! [Clare] We're just metal. There's a bit of everything in what we do. [Giles] We're all metal fans, but we're all into different styles. Clare and I , we tend to go down the thrash route, Glynns very much into power metal type of things, epic metal. We all bring different influences into it, so you cant really put it into one sub-genre - its just metal really. [Giles] If it sounds good - if we like it then we'll play it basically. Q: After you split from your previous guitarist (Gav Owen - now with Power Quest), you had quite a long break - why so long? [Clare] And it was the right time as well. [Giles] And it worked out well because Glynn came to join us, so all is good. Q: Last night was the first time I've heard Glynn play. [Clare] Not bad. He's his own worst critic though for sure. Q: At the end of last year you toured with Kobra and the Lotus. Any more tours planned at the moment? [Krissie] Nothing of that scale planned at the moment - that was 10 dates over arround two and a half weeks, so nothing of that size at the moment, but we are looking at one or two, what we've called mini-tours. [Clare] We're trying to organise something around May and we want to try and play a few places we've never played before, maybe Brighton, maybe Manchester. [Clare] Oh yeah we'd like to go back to Newcastle - we really enjoyed it there, and we're going back to Wakefield in July, so that will be good fun, and we're finally going to be playing Reading in May which is my home town. [Clare] Face bar, yes. Maybe we should all wear glow in the dark outfits that day. [Owen] When we played the Asylum2 in Birmingham we had to count your frets every time you had to play further up. Q: Any more festival appearances likely this year? [Giles] It'd be an honour to play Bloodstock again because its such a great festival. [Clare] I guess the only thing is that we're unsigned and we've already done the unsigned stage so..
[Giles] There's a lot of competition to get in to these festivals. [Clare] They want to keep it fresh which I understand, with new bands, but you know, Sonisphere, Download, European festivals, we're so up for that. [Owen] I'm influenced by everything from pop to metal, so bands like Sonata Arctica, Stratovarius, Sabaton, and then on the other end of the scale, Bon Jovi and stuff like that. [Clare] My main influence for playing and what we do is classic heavy metal - bands like Iron Maiden, Megadeth, Metallica, the just kid of big daddies. A lot of thrash for me, and more recently, a lot of death metal bands. [Glynn] I like metal because of video game music. [Giles] He's not really like us is he? [Glynn] I'm really into Megadeth - thats the reason I started playing. I like bands like Children of Bodom, Blind Guardian is one of my favourite bands. There's a band called Equilibrium - they've done three albums now, I think they're really awesome. I like everything apart from like really brutal stuff or screamo. [Giles] I grew up on Metallica and Iron Maiden. and then got into Megadeth. Megadeth are probably my favourite band. I like some of the new wave of thrash metal bands coming through, specially from the UK. I'm really into Sylosis, one of my favourite bands at the moment, and Evile, bands like that. Q: I was going to ask which bands you were looking forwards to seeing bu I've heard several of them already. I get the idea Krissie might want to see wolf. [Clare] Wolf are awesome and it will be really good seeing them in this setting as well - a festival setting, small venue setting, so it shoudl be good to see them again. Accept, Sylosis, Evile. [Owen] Turisas and Sabaton - thats why I'm here (apart from playing last night). Thats why I'm still here. [Giles] Loads of bands really, its going to be good. Q: Its two years since your album came out, so whens the next one coming out? [Giles] Tomorrow. No. We're writing, we're booked in to record our album over a four week period in September, with well known producer Chris Fielding at Foel studios in sunny mid-Wales [surely a contradiction in terms]. He's worked with Napalm Death and a load of other big bands and so we're writing furiously at the moment and some of its really good. Some of it we've been playing but there's loads of good ideas so its going to be a proper big long album. We've no date set to release it but its going to be early next year. It'll be done in October but there'll be all the mixing, getting it hyped up, sorting out a tour and everything, so early next year sometime, but there's definitely one coming. [Clare] Yes there's one on the way. Q: Krissie, I notice you do seem to be obsessed with Wonder Woman. Any plans to dress up as wonder woman on stage? [Krissie] I think if it was a charity event where it was fancy dress and somebody said "I'll sponsor you X amount to the charity if you'll get on stage as wonder woman" then yes. Otherwise its only for parties. Q: Thanks for your time everyone and I hope you're not too hungover. [Krissie] No we're all still drunk.